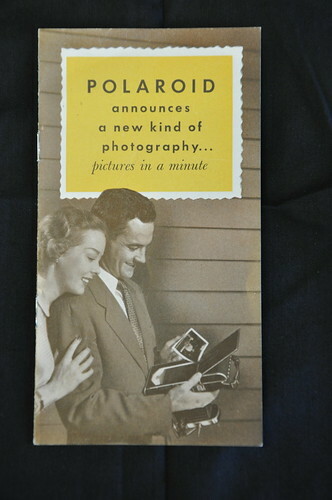 Today in 1947 the Polaroid Land camera made its debut. The Libraries featured Polaroid items from its trade literature collection last year, as well as museum objects from the National Museum of American History. I’m a diligent rss reader of this site for which I’m grateful but I have to tell you, I click much less frequently through to the links in your pieces because the URLs are shortened. This is mostly because I don’t want to be taken to the catalogue pages. But it’s also a personal protest, of sorts, against URL obfuscation, which is a shame, because I know they aren’t the only links posted here. I also don’t get on trains when I don’t know from the outset where it’s going. Small complaint sure, but I’m a big fan so thanks for everything (everything else, other than bit.ly, that is). Peacay, thanks for the comment and for your loyalty to the Smithsonian Libraries’ blog. We’ve been reevaluating out shortening philosophy and agree that embedding the bit.ly links is a bit of overkill. We’ll continue to use shortening when relevant (Twitter, print publications, email).